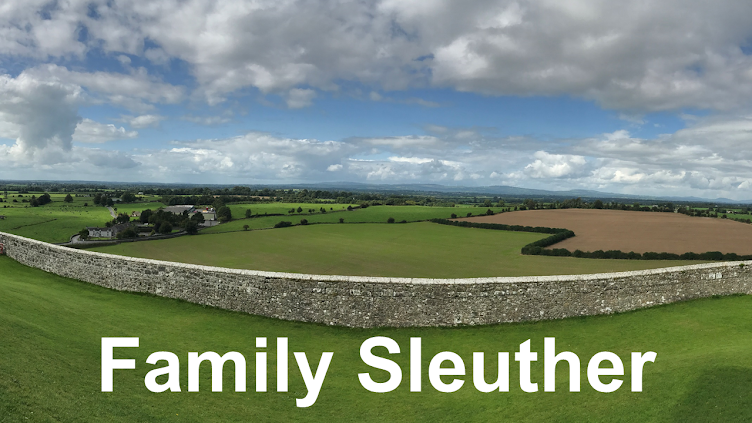 Family Sleuther: Deciphering an Irishman's Death: Was It Accidental? In spring 2016, I learned that my second great-grandfather John O'Connor was actually born John Flynn Jr. His name was changed by adoption following the untimely death of his parents John (Sr.) and Margaret (Fahey) Flynn. John and Margaret were born in Ireland and immigrated to the United States sometime in the mid-19th century. But where in Ireland were they from? 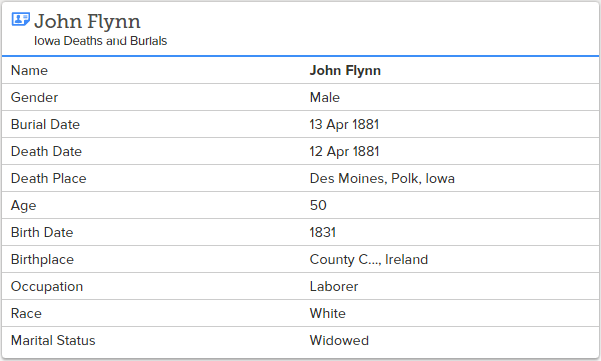 Two years ago, I found John Flynn Sr. in a transcription of the 1881 Iowa death index. Unfortunately, at that time, an image of the record was not yet digitized. I wanted to get my hands on a copy of the original record because the transcription included a tantalizing clue about his ancestral origins: his birthplace. This is a highly-desired, mission-critical piece of information for anyone digging into Irish genealogy. Frustratingly, the record transcribed his birthplace as: "County C..., Ireland." Real funny, FamilySearch transcriber. Hilarious! I'm glad we narrowed it down, but there are still four counties among Ireland's 32 that begin with the letter 'C'. Where was John Flynn Sr. born? Was it County Carlow? Perhaps it was Cavan or Clare? Maybe Cork? Fast-forward to July of this year, when I began revisiting some of my paused genealogy questions. 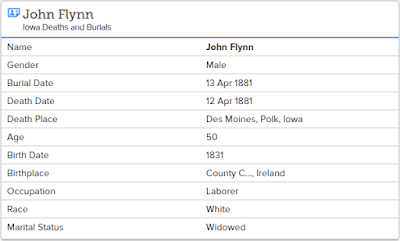 I plugged John Flynn Sr. into FamilySearch and, lo and behold, the microfilmed death record that was once tucked away in the Granite Mountain vault had finally been digitized. I now knew his Irish county of birth. John Flynn Sr. was born in County Clare, Ireland. Those few additional letters will help narrow my Emerald Isle research, and I look forward to picking up that thread in the coming months. But there was something else that caught my eye on the newly digitized record: John's cause of death. John was only 50 years old when he passed away, which seemed relatively young. He was a widower at the time of his death, indicating that Margaret had pre-deceased him. What were the circumstances of John's death that would leave his son John Jr. an orphan and, eventually, adopted by the O'Connor family? The death index recorded his place and cause of death. He was mortally wounded in the head by something or something else when he was drunk? Wait a minute. You mean to tell me that a long night (he died at 7:30 in the morning) of drunkenness forever changed the surname for a branch of my family tree - Flynn to O'Connor? Unable to read the penmanship, I crowd-sourced an answer. I shared the above image with the Deciphering Genealogy Script Facebook group. Within minutes, genealogists began offering their interpretations of the script. Twenty-four comments later, the consensus was that John Flynn Sr. was killed by a "Wound upon the head, inflicted with a cinder or clinker when drunk." What in the world is a cinder or clinker? According to Merriam-Webster's online dictionary, a cinder is "the slag from a metal furnace" or "a fragment of ash" or "a partly burned combustible in which fire is extinct." A clinker, on the other hand, is "a brick that has been burned too much in the kiln" or a "stony matter fused together." Where does one find a cinder or clinker? I was curious about the location of John's April 1881 death. What was around him at 307 6th Street in Des Moines, Iowa? I turned to the Library of Congress' wonderful maps collection, and found a March 1884 Sanborn Fire Insurance Map for Des Moines. In 1884, the Sanborn map indicated that an empty lot and the U.S. Signal Service were located at the approximate site of 307 6th Street (marked by the red arrow below). However, next door was the Eclipse Coal Company with a coal and lime shed. Did the clinker or cinder that wounded John come from the Eclipse Coal Company? In the next city block there was another business potentially relevant to this case. At 604 Walnut Street (the cross street between the 300 and 200 blocks of 6th Street) was a saloon. Next door, at 606 Walnut Street was another saloon with a billiards room. Perhaps they were the same establishment. In either case, the saloon was just minutes and yards from where a drunken John Flynn Sr. was found dead. Did John spend his evening in this saloon before crossing to the 300 block of 6th Street where he suffered the fatal head wound? Was it accidental? Did he slip and fall, hitting his head? Or was he attacked? Perhaps there had been a fight? For now, I can only speculate. While we may never know the details, I'm on the hunt for a coroner's inquest - if one occurred and survives - and newspaper accounts of his April 12, 1881 death. Either one could shed more light on John's untimely passing. I was happy to read the record you needed is now available online. There's always one more question, Michael. Good luck finding a newspaper accounts and/or coroner's inquest. I've turned up a couple promising leads, and I think I'm onto a doozy of a family history story that was definitely not passed down the generations. Great detective work! I didn't know about that FB group---sounds like a group I could use now and then. I hope you find out more! I do recommend the group, Amy. It was great to have input from other family historians, and it came quickly, too. It's a helpful resource to have at hand.